The origins of the shroud and its image are the subject of intense debate among scientists, theologians, historians and researchers. Some contend that the shroud is the actual cloth placed on the body of Jesus Christ at the time of his burial, and that the face image is the Holy Face of Jesus, while others contend that the artifact was created in the Middle Ages, as indicated by carbon dating which placed the artifact between 1260 and 1390.The catholic church has neither formally endorsed nor rejected the shroud, but in 1958 Pope Pius XII approved of the image in association with the Roman catholic devotion to the Holy Face of Jesus. 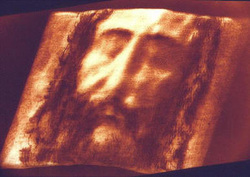 Secondo Pia's 1898 negative of the image on the Shroud of Turin has an appearance suggesting a positive image. It is used as part of the devotion to Holy Face of Jesus. The shroud includes images that are not easily distinguishable by the naked eye, and were first observed after the advent of photography. In May 1898 amateur Italian photographer Secondo Pia was allowed to photograph the shroud and he took the first photograph of the shroud on the evening of May 28, 1898. Pia was startled by the visible image of the negative plate in his darkroom. Negatives of the image give the appearance of a positive image, which implies that the shroud image is itself effectively a negative of some kind.Pia was at first accused of doctoring his photographs, but was vindicated in 1931 when a professional photographer, Giuseppe Enrie, also photographed the shroud and his findings supported Pia's.In 1978 Miller and Pellicori took ultraviolet photographs of the shroud. There are other theories regarding vapors from the body diffusing to the Shroud and producing the image. Another theory is a direct contact process in which substances were directly transferred to the cloth and produced the image. DeSalvo's Theory takes both of these into consideration. I decided to explore this similarity in more detail. I was hoping that by understanding how Volckringer Patterns are produced, it would give me some idea of how the Shroud body image was produced. Using a spectrophotomer I did a color comparison between the Volckringer patterns and the Shroud body image. Within experimental error, I showed that the Volckringer patterns were identical in color to the Shroud body image. I than compared the Shroud and Volckringer patterns using UV Fluorescent studies. It was shown that both the Volckringer patterns and the Shroud body image do not fluoresce under UV light. Thus the Volckringer patterns and Shroud body image also have identical UV fluorescent characteristics. The most startling similarity was that the Volckringer patterns could be reconstructed in 3D relief using a VP-8 analyizer, just like the Shroud body image. In summary, Vockringer patterns resemble the Shroud body image in negativity, visible color characteristics, UV fluorescence properties, and 3D reconstruction. 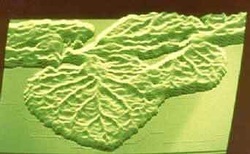 Volckringer patterns are produced when acids from the plant are transfered to the paper causing cellulose degradation (oxidation). The most prominent plant acid in this process is lactic acid. Where would lactic acid fit in with the Shroud body image formation process? Human perspiration contains a certain amount of lactic acid. A person who had been tortured and crucified would have sweated profusely and medical studies have shown that this perspiration would have very high concentrations of lactic acid. Thus, this could have been the transferring agent involved in producing the body image on the Shroud. The lactic acid would have been transferred to the cloth by both direct contact and vertical diffusion. Areas of the body like the nose that touched the cloth would transfer the lactic acid by direct contact. In the areas further away that did not touch the cloth, i.e the cheeks, the lactic acid would travel to the cloth by diffusion. Thus two processes, both direct contact and vertical diffusion would transfer the lactic acid to the cloth. Than this acid would oxidize the cellulose in the linen and produce the image over a period of time. It may be that originally there was no image on the cloth and after many years the lactic acid working on the cloth eventually developed the image. This is what occurs with the plant matter in books. My theory does not answer all the questions. Some problems are that the Shroud body image is a surface phenomena but the Volckringer patterns are not. They penetrate into the paper. 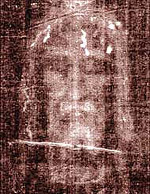 Also calculations using diffusion of lactic acid would not produce the high resolution of the image we see on the Shroud. Thus my theory does not explain all the characteristics of the Shroud and more research needs to be done. 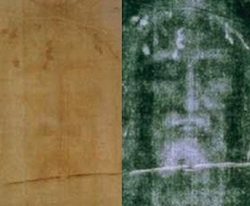 Thus no one theory to date can explain how the image on the Shroud was produced. 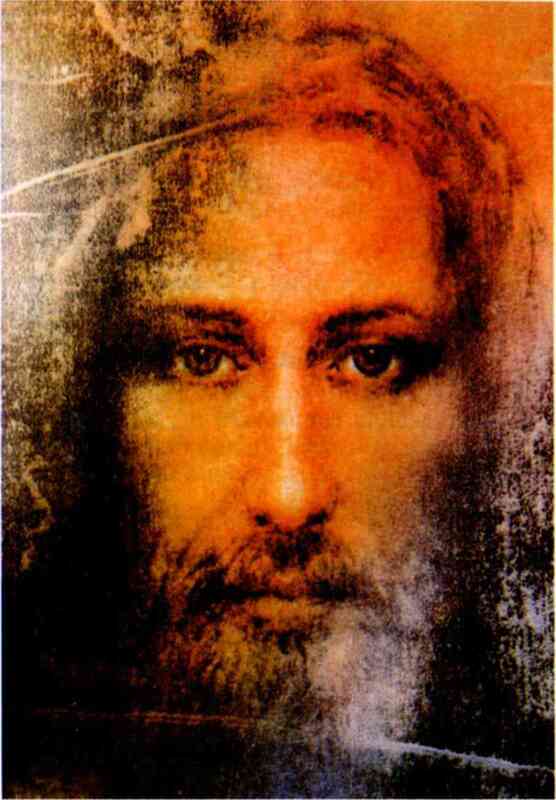 The proof that this is the face of Christ! It?s been called the longest-running hoax in history - an 800-year-old religious riddle that's taken in popes, scientists and believers from all faiths.The Turin Shroud has been either worshiped as divine proof that Christ was resurrected from the grave or dismissed as a fraud created by medieval forgers.But new evidence suggests the shroud might be genuine after all. As Mel Gibson's film The Passion Of The Christ rekindles interest in Jesus, stitching on the shroud which could have been created only during the messiah's lifetime has been uncovered. At the same time, tests from 1988 that dated the shroud to between 1260 and 1390 have been thrown into doubt. Swedish textiles expert Dr Mechthild Flury-Lemberg, who discovered the seam at the back of the cloth during a restoration project, says: "There have been attempts to date the shroud from looking at the age of the material, but the style of sewing is the biggest clue. "It belongs firmly to a style seen in the first century AD or before." Her findings are being hailed as the most significant since 1988, when scientists controversially carbon-dated the 14ft-long cloth to medieval times, more than 1,000 years after Jesus died. Yet experts now say the team unwittingly used cloth that had been added during a 16th-century restoration and it could have been contaminated from handling. Mark Guscin, of the British Society for the Turin Shroud, says: "The discovery of the stitching along with doubt about the carbon-dating all add to the mountain of evidence suggesting this was probably the shroud Jesus was buried in. "Scientists have been happy to dismiss it as a fake, but they have never been able to answer the central question of how the image of that man got on to the cloth." Barrie Schwortz, who in 1978 took part in the first scientific examination of the shroud, says: "I was a cynic before I saw it, but I am now convinced this is the cloth that wrapped Jesus of Nazareth after he was crucified." THE history of the cloth - which bears the ghostly image of a bearded man - is steeped in mystery. "On one such occasion Sai Baba stopped in front of them and looked at the items that Barbara's friend held out to him for a blessing. However he refused to accept the crucifix. When will we Christians take Christ off the cross and place him in his proper context? It has been said of the cross at another time, "Let the longer piece of the cross represent God's Will and the shorter piece your will. If you lay the two pieces side by side, parallel to each other, there is no cross. It is only when your will conflicts with God's will, when you cannot say Thy Will be done, O Lord, that the cross is created. If your will acquiesces with God's will, there is no cross. The way to take down the cross: therefore, is always to accept gladly and lovingly whatever trial, pain or loss God sends and surrender your ego". Then, as Sai Baba focussed his attention on her friend's photograph of Christ, Barbara watched spellbound as with a lift and a wave of his hand Sai Baba drew from that photograph of the Turin Shroud the black and white image of Christ until there was nothing left but a blank sheet of gloss paper. Then, in the same manner, he created on that blank sheet (just as if it were in a developing tray in a darkroom) the colour image of the Risen Christ as you see it today. This image has eyes so full of love and compassion that they comfort and touch you on a deep inner level when you come into its range of vision. Then, with a blessing for the two women from New Zealand, Sai Baba went on his way, knowing full well that life would never be the same for them again! This seems to be the case for all those who have visited Sai Baba, including myself. Barbara said, during our first conversation in the hotel, that it was apparent to her that Sai Baba wanted me to have the photograph and to take it hack to England. Apparently I had ignored the invitation whilst staying at his ashram, and so the photograph had to be placed before me in such a fashion that I could not ignore it! It was a case of when Mohammed won't come to the mountain, then the mountain has to come to Mohammed. Barbara and I continue to keep in touch with each other's progress and we are both very much aware of how close we are, not only to each other, but to the Source."